There are times that you feel that your life is in monotone, black and white or hueless. But there are chances that aid to put color to your life albeit temporary, its good enough to let you realize your existence. I thought, I am alive then. These may be quick moments, a blurry vision but its enough to put a melody to my heart. Never thought I will be using the word heart here. Well, I must accept I have one and its still working in good conditions. I think we all dream to find our destiny, our better half asap. But we can't control it, fate has its way of scheduling things despite the efforts you make. Life is real, not ideal, but its not wrong to set your path on an ideal way. Just lower your expectations because if things result to a not-so-favorable one, you might find it difficult to recover. Save some energy just for yourself. And yes, I hope more of an ideal relationship will come soon. Maybe. Fingers-crossed. and counted each other's missing teeth. while your lips rest on mine. and wait until our clock of life stops. I will love you, Betsy Faye. Life can be a fantasy too. Fantasy in a real world. Listen to the music within you. Great post. I don't think anything in life can be ideal. It is always a compromise. love the poem totomai. kilig! haha :) and the pic has a beautiful concept. just keep crossing your fingers. and believe! We learn as we go along! "Life is real, not ideal"...I loved that line! The whole poem was beautifully moving, and the photo added so much impact. Poignant! Thanks so much for sharing. fantasy always wins out but we can dream right? Of course. One hopes. One wins, one loses. One hopes again. The 'time' of this is wonderfully tuned. Beautiful MYM photo. And I really like your post, too. Love the kaleidoscope of "colour" tones that you included in this post! Fascinating whirlwind of feelings! Totally awesome...the photo and the verse...Thanks for sharing. A wonderful picture, a beautiful white flower! So moving. Made me read it over and over again. Beautiful hues like a dream.. This is a wonderful post. Thought provoking and raw. Recently I stopped leaning forward into fantasy and rest in the presence of what is, this feels so peaceful. And yes, life can be fantasy too. 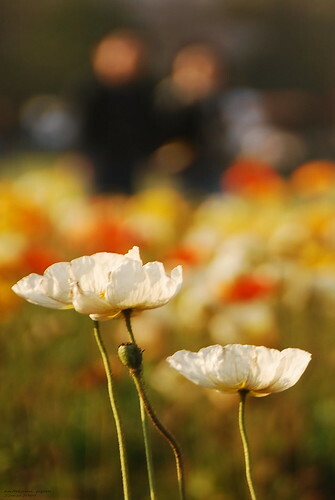 Your flower photo is lovely. A great image, beautiful poetry. Beautiful picture and a lovely poem!! Beautiful poppies, and a lovely poem. Thanks. The ephemeral quality of your Iceland Poppies goes so well with your sentiments. Your this weeks photo is so lovely.